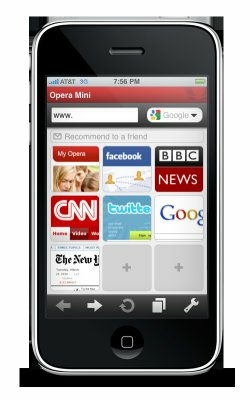 Representatives of Opera have announced that an iPhone version called Opera Mini was submitted to the Apple App Store for approval. The mobile version of one of the fastest browsers in Internet land first appears at the Mobile World Congress 2010 last February. The Opera Mini assures users that it can load pages up to six times faster than Apple’s browser Safari. It is done by server-side rendering that compresses data by up to 90 percent before being sent to the phone. Not only it loads pages faster, the users benefit from more Web per megabyte, which lowers the cost of browsing through mobile Internet. But having the Opera Mini approved may not be easy. Because of its server-side rendering, there is no code interpretation being done by the software, which could give a thumbs down. Apple also checks whether the Opera Mini would provide a perceived duplication of core iPhone functionality, another sing of rejection. However, some tech experts contend that several WebKit-based browsers have been approved for the App Store.